Some might say I am too passionate about our industry. I get fired up because I believe so strongly in what we are doing. Life insurance is noble. I am proud I work in this industry…as a matter of fact, I have only spent a couple weeks of my 20 year career working outside of this business. Despite the importance of life insurance, our industry trends have been pointing down for as long as I’ve worked in this space. One of the more frequent questions I am asked is, “Has the industry bottomed out yet?” I have to admit that I am not sure, but I remain hopeful that we can begin to change the trend. We have to face reality that we are in a crisis. At some point along the way we lost the trust of the consumer. 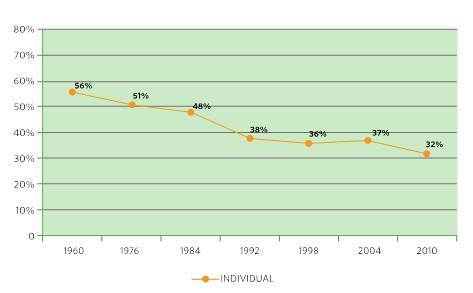 There are a lot of factors contributing to this, but if you follow the 60 year trend line of individually owned life insurance you can see us losing trust year after year. As the world changed, we played catch up, playing from behind instead of ahead. In my first blog I shared some of the questions we have been discussing among our management team. So how do we answer those burning questions? I think we need to start by determining if those questions were the right ones to ask. If we cannot agree on that, then the premise does not hold and the answers will lead us nowhere – we will still be in denial. So, let’s agree some of those questions are valid. The next sentence is pretty harsh, but I am going to say it anyway. If you don’t think we have a trust issue with consumers you probably shouldn’t still be reading this blog. Our priority should be establishing trust with the consumer. To do this, we must first look internally and evaluate our own operations. What level of commitment does our team have? We must make sure our whole team is on board – from the bottom of the line to the top. Marketing strategies must be designed to capture the consumer’s interest and adequately fill the needs of the consumer. Underwriting needs to be seen as a strategic asset. Life insurance needs to look appealing and they have to trust we have their best interest at heart. We have to take the time to train and educate our team so knowledge can be passed from the agent to the consumer. If we can make this commitment internally, then we will be one step closer to our goal of rebuilding trust with the consumer. Let’s embrace rebuilding trust. Let’s see that every family in America has an appropriate amount of life insurance. We are betting on our industry and we are setting that as our goal. Our strategies at ExamOne are being built on the premise that we can all do more, do better, do our part to enable higher degrees of transparency and trust and focus on the needs of the consumers. Let’s hold each other accountable. Next post: State of the Life Insurance Industry: Who decides?